Simple Stripe is the miniature quilt featured on the January Temecula Quilt Company 2015 calendar card. 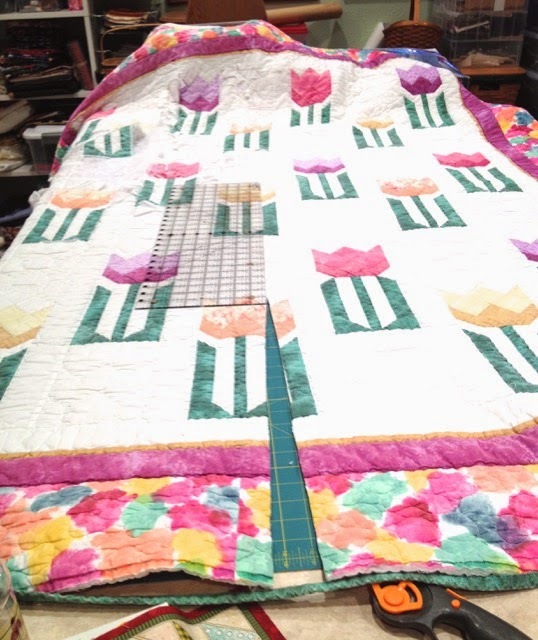 The colored stripes are scraps from larger quilts and the sashing/binding a fat quarter purchased long ago. I pieced some batting scraps together and added some minimal quilting, i.e. "stitching in the ditch" to complete this miniature. The Temecula Quilt Company seems to specialize in mini quilts. Even though I am not a fan of working with such tiny bits of scraps, I hope to complete the monthly mini featured on the calendar cards I purchased in December. Do you like to create miniatures? 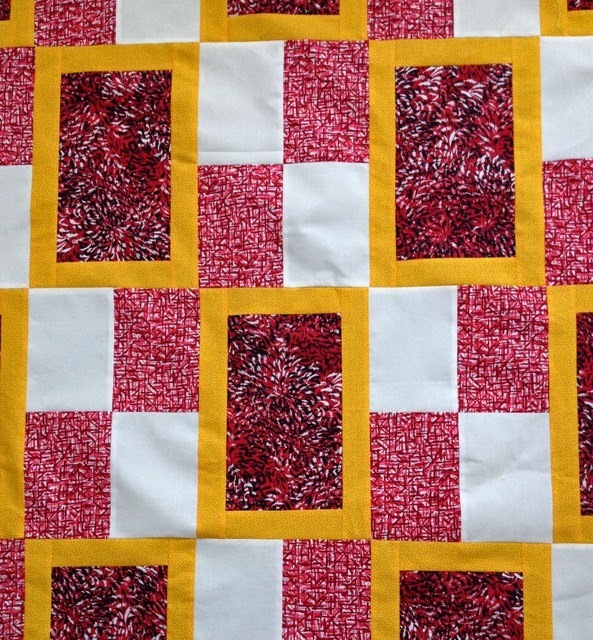 The fraternal twin of this quilt can be seen in yesterday's post. 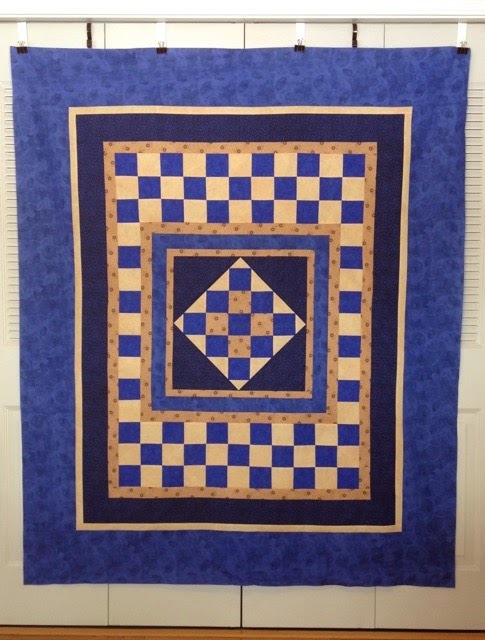 A list of all the Quilts of Valor that I've made can be seen here. 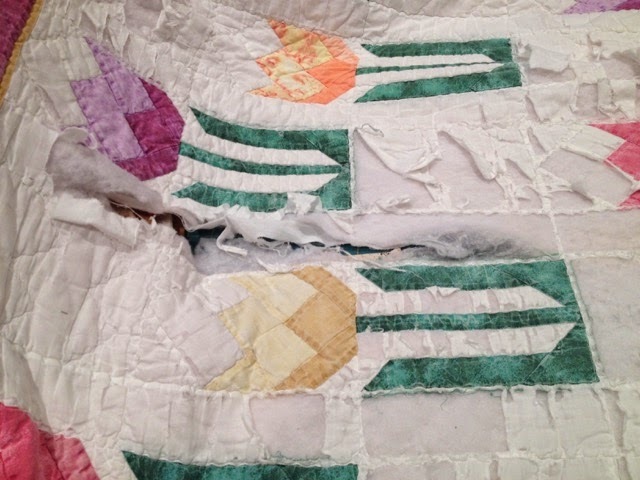 The fraternal twin of this quilt will be shown tomorrow. 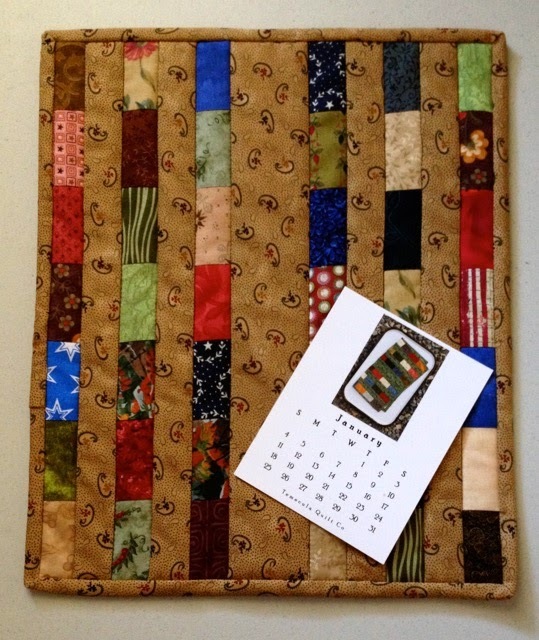 Late November 2011, I was intrigued when the Temecula Quilt Company introduced a holiday miniature quilt along (QAL), called the 12 Days of Christmas. 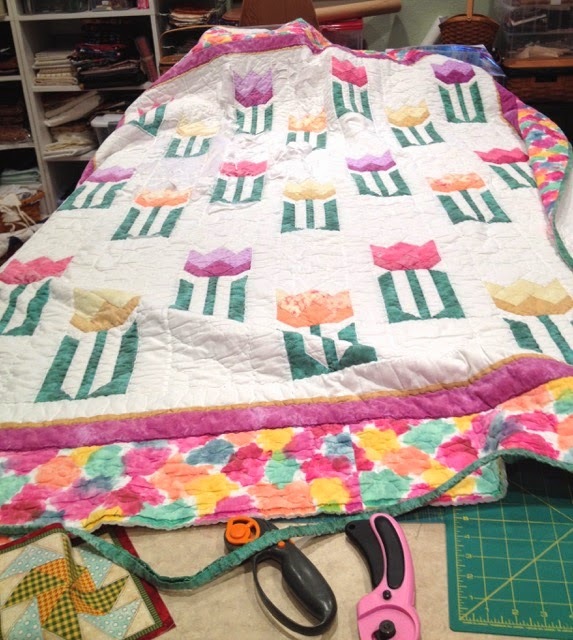 Beginning on December 1, 2011, the directions were posted on the Temecula Quilt Company blog for twelve days. Each block contained pieces corresponding to the day's number, i.e. 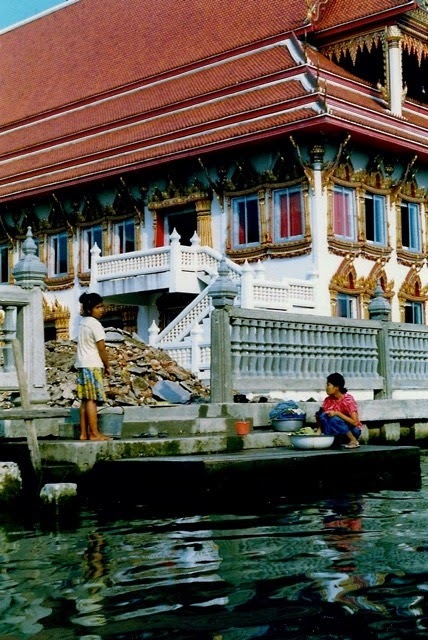 the ninth day's block contained nine pieces. I faithfully finished the miniature blocks (click on the link to see the original post). Then the blocks were shuffled from pile to pile and box to box in my sewing room for over four years. 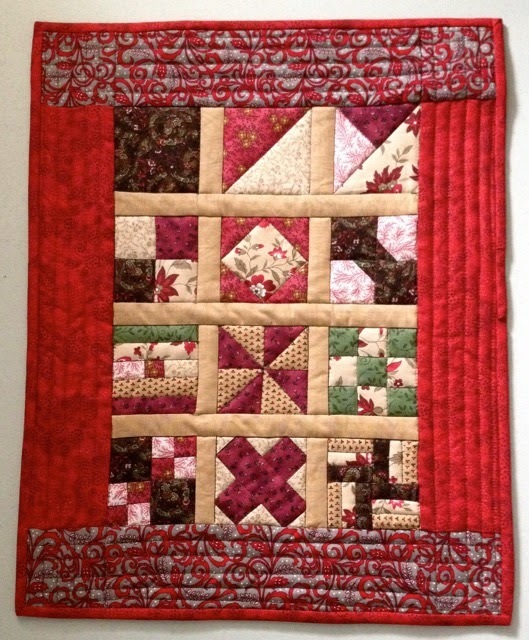 Temecula hosted the 12 Days of Christmas QAL again in December 2014, which jogged my memory of the completed blocks stashed somewhere in my sewing room. In early January 2015, Bonnie challenged her blog readers to spend 15 minutes each week to tidy their sewing rooms. I took the challenge and began bringing some semblance of order to the chaos: I sorted patterns, folded and stored fabric, cleaned off my cutting table, found UFOs, and cut scraps into manageable sizes. It was in this fury of activity that I found the mini blocks and decided to finish this project. Last weekend, I selected the sashing and border fabrics, sewed the top together, patched some batting scraps, machine quilted and added binding to the mini. 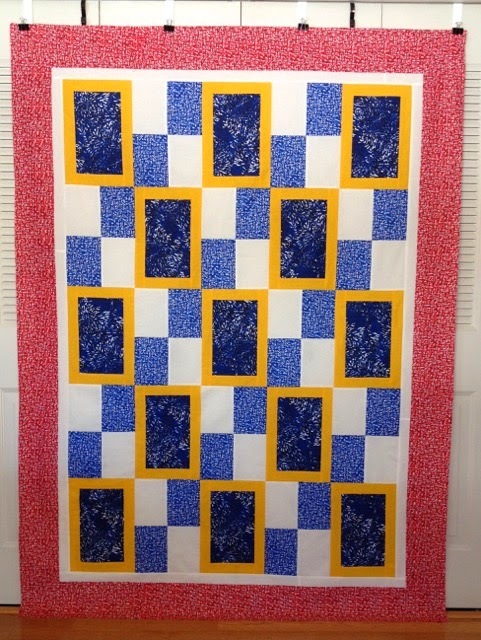 Some of the blocks are wonky, and the quilting is not straight; however, it is finished. Despite this mini's glaring imperfections, I like it. Do you have a UFO that you haven't finished because it isn't perfect? 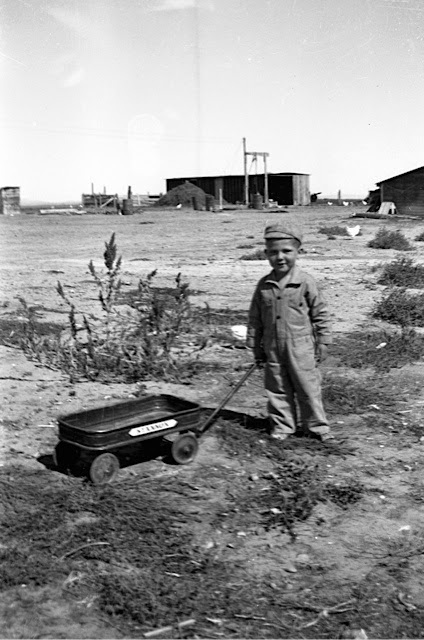 Jerry looks proud of that little red wagon. I wonder how many miles he pulled it while playing on the farm. Over the long weekend, I managed to get some sewing done on two Quilts of Valor - fraternal twins - one made with red fabric; the other, with blue. The blocks are fairly large, and the tops will be finished in short order, resulting in #52 and 53. The Post Office held my mail while I was gone at Christmas, and when it was delivered, my box was stuffed with the daily newspaper, advertisements, and a few stray Christmas cards and bills. The carrier crammed as much of the mail as he could in the box and delivered the rest the following day. 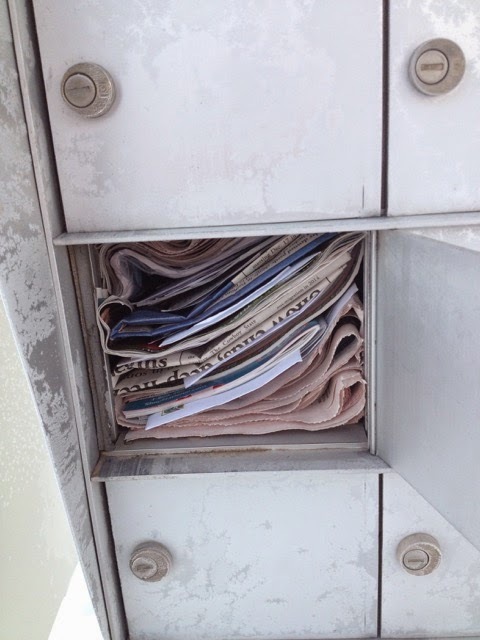 Sometimes, my life resembles this mailbox - crammed with useless items and tasks: so crowded that it is impossible to discern the important from the trivial. 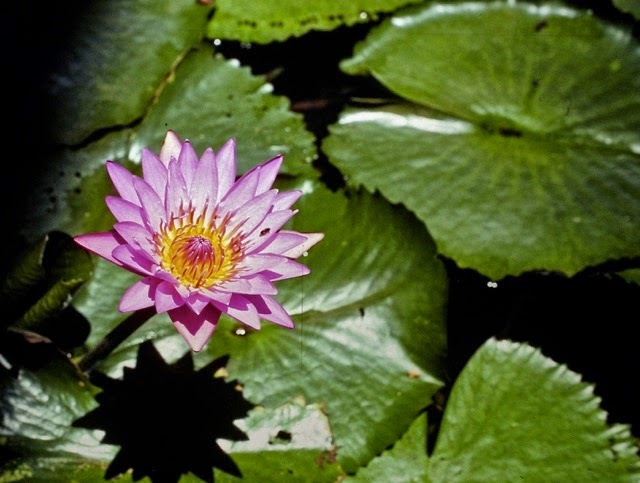 Last week, I had appointments, errands, meetings, and commitments nearly every day. It felt like I didn't have a moment to myself, and I didn't like that feeling. I've grown accustomed to and enjoy having downtime. Frankly, I don't know how I ever had time to work. 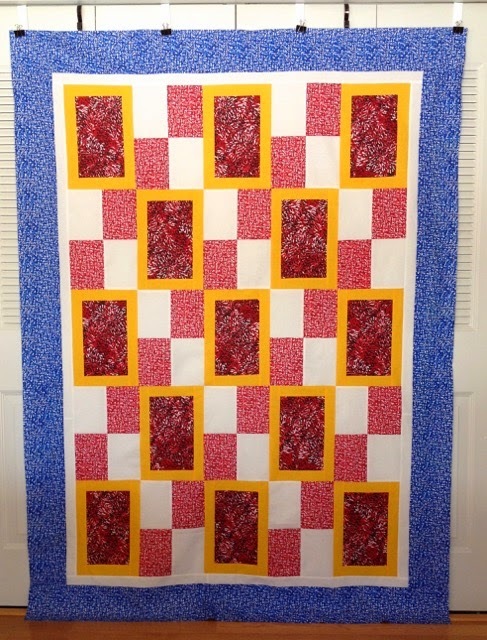 Tranquility is Quilt of Valor #51, and the first QOV top for 2015. 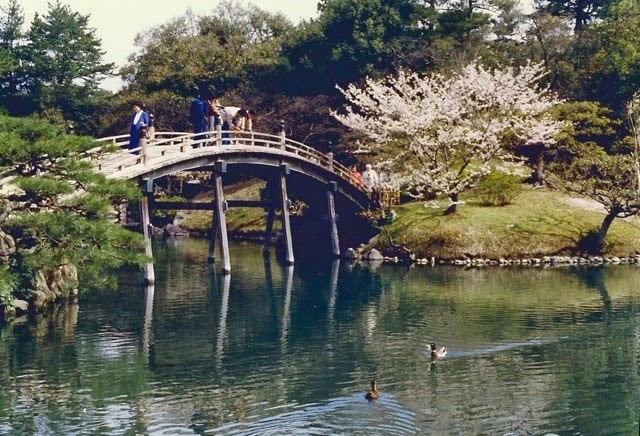 I can honestly say that the parks in Japan are the most beautiful and serene that I've visited. After we finished eating Christmas dinner, Marilyn posed the question about a memorable gift we received in the past. 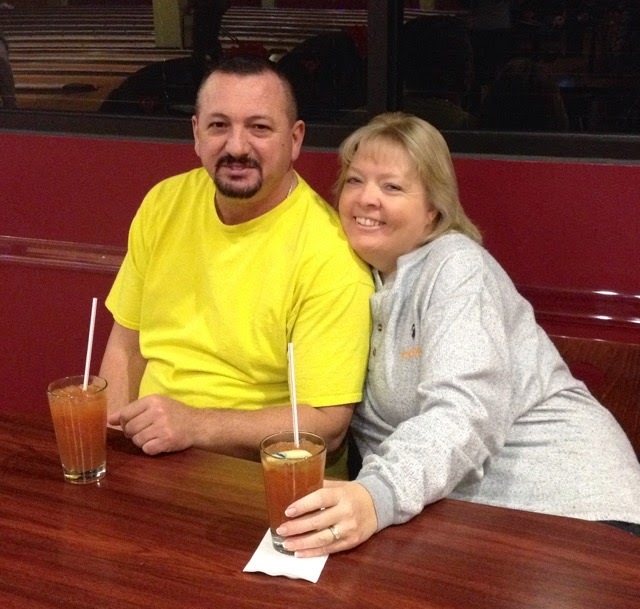 Not many could recall a specific gift, so we started talking about past Christmas gatherings. 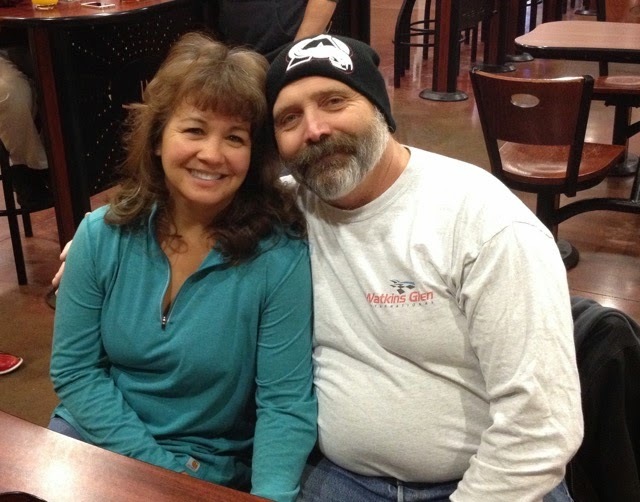 Somehow, the conversation turned to a particular Christmas celebrated at Bull Mountain Ranch near Laramie, WY, and I mentioned a gift that Chris had received that year - a storage bag for his Darkwing Duck figurines that his mother (Maria) had made and painted for him. Chris' face brightened as he remembered a favored toy from his childhood. Then, Harold said there was a Darkwing Duck bag in the storage garage. Chris asked if they could go get it right then, so coats and shoes were donned, and flashlights gathered, and off they went in search of a treasured childhood toy. They returned with the denim bag with Darkwing Duck characters and a Darkwing Duck airplane, and suddenly everyone at the table was transported back to an earlier Christmas. The happiness I saw on Chris' face as he examined and explained each character was priceless. 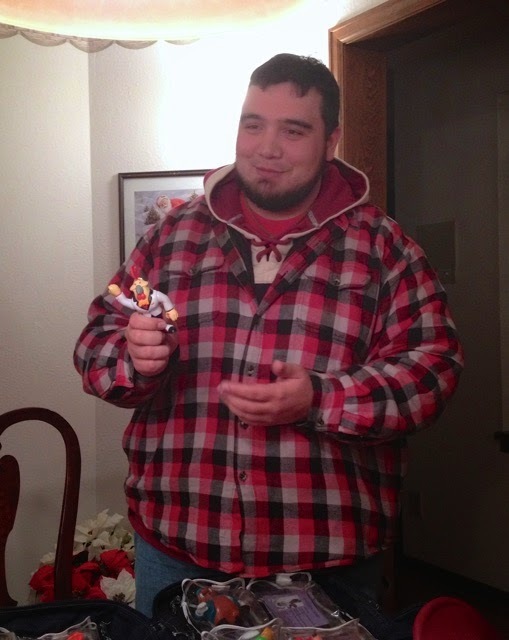 He received these toys when he was four or five, and now some 20+ years later, he was swept back to cherished memories. He was beaming! Have you saved any of your own favorite toys or those of your children/grand children? I could hardly believe my eyes when I saw this sign in Colorado. On the way north to Riverton, I spotted a sign for $1.93 along the Interstate in Cheyenne, WY. 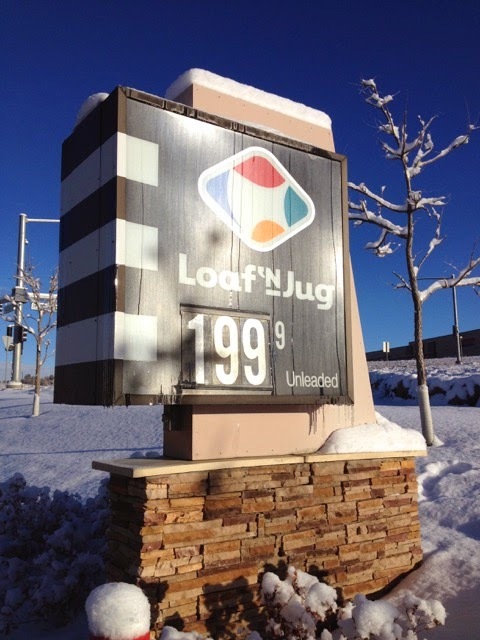 However, the prices are still in the $2.40-$2.50 range in Riverton and the surrounding area. 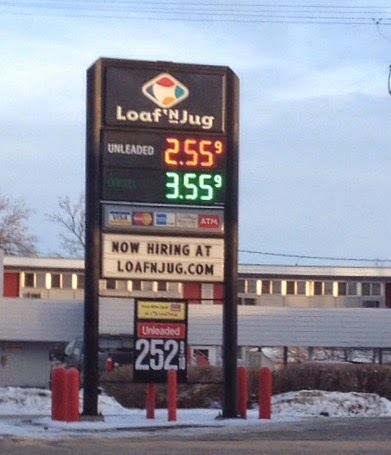 The photo above was taken last week, and since then the price has dropped to $2.45 a gallon. Even though Riverton consistently has higher prices than other towns in the state, that is a considerable price range. I doubt the lower prices will be available in Riverton for a long time, and possibly never. 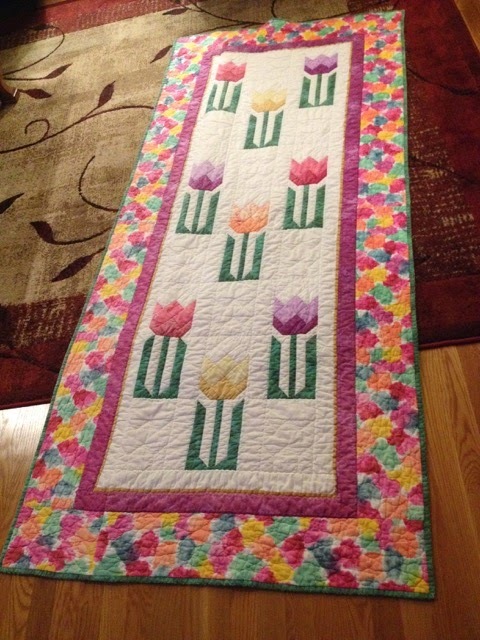 Maria, my nephew's wife, made this tulip quilt several years ago, and gave it to her mother. The nursing home frequently washed the quilt, and either the strong chemical wash or the laundering itself was not kind to the quilt. 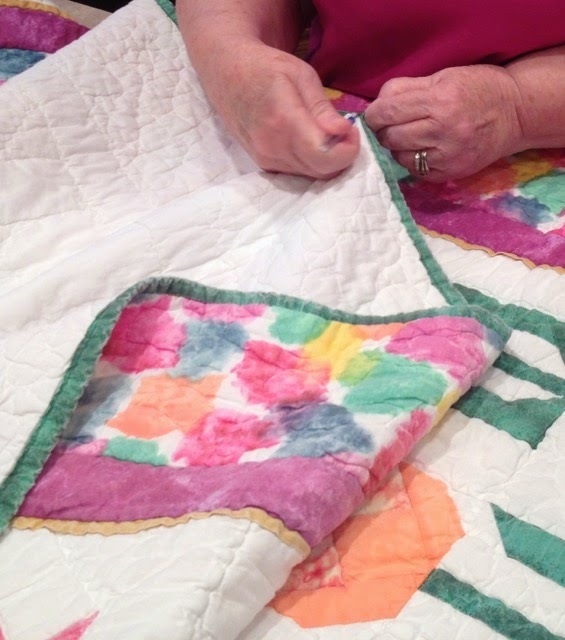 Since Maria lost her mother to Alzheimer's this year, the quilt had a special meaning for her. She asked if Marilyn and I could salvage enough of the quilt to display on a quilt rack. We looked at the quilt and discussed ideas with Maria. We wanted to know what her expectations were. She rolled up the quilt and took it back to the bedroom. The following day, Christmas Eve day, Maria and Dwight went to visit Maria's aunt and uncle, so Marilyn and I tackled the project as a surprise Christmas gift. 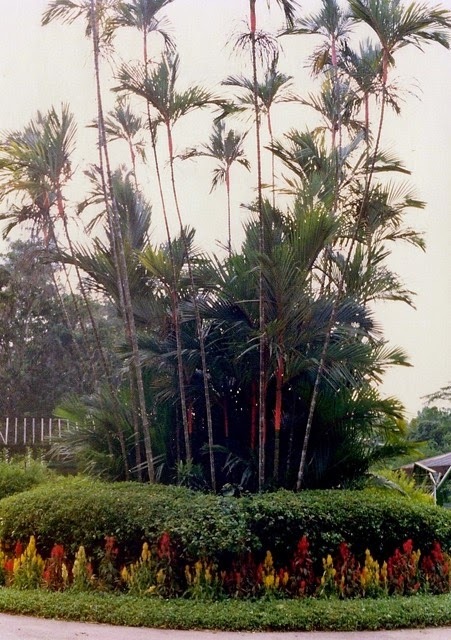 This photo clearly shows the damage and its severity to one area. We determined an action plan and began picking stitches to remove part of the binding so it could be reused. Then, we made the first cut to remove the damaged section and allowing for seams. Applique butterflies were ironed on some small holes and some larger ones, too. Dwight and Maria returned before we were finished, so we had to wait until they went to bed before the quilting elves could add the finishing touches. The final chore was hand tacking the binding and the fabric we added to the backing to camouflage the seam. 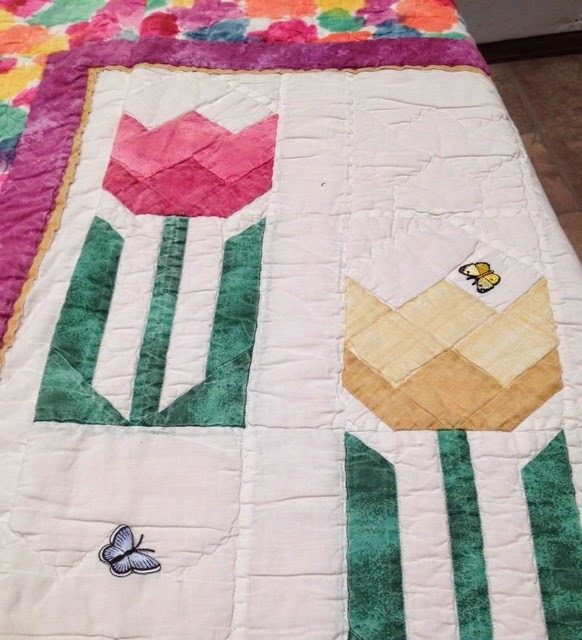 repaired quilt without butterflies to hide the smaller holes. 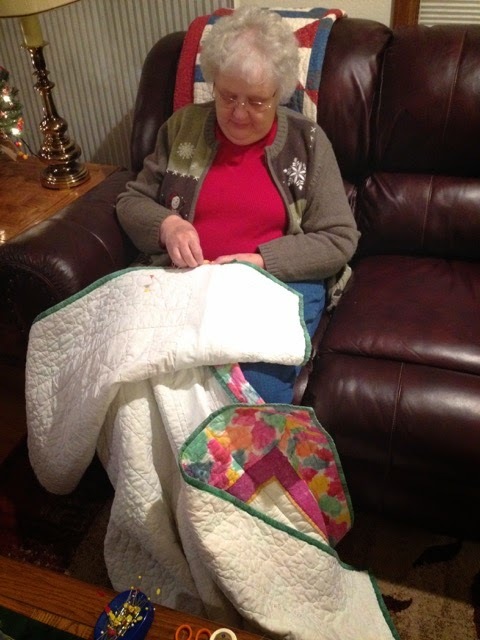 Marilyn presented the repaired quilt to Maria on Christmas morning. She was surprised and emotional: she thought since we had only given ideas and suggestions that we were not going to do the repair. Her hugs and tears were straight from her heart. Even though I was in Japan two years, I only saw Mt. 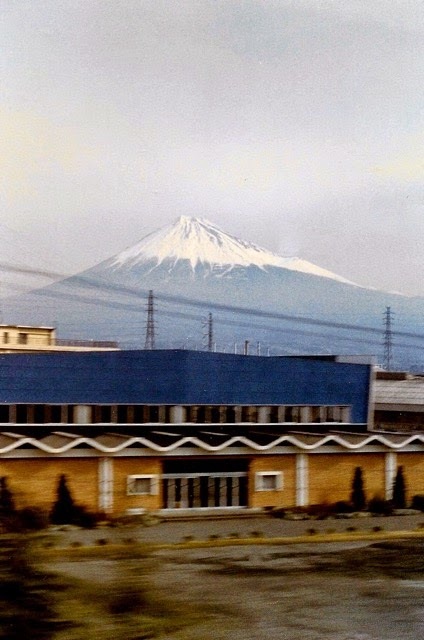 Fuji this one time, through the window of a speeding train. 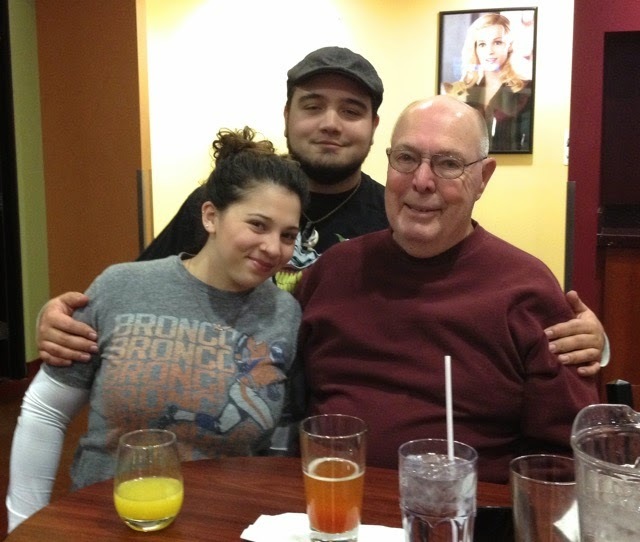 Emma became a part of my nephew's family in November, and she accompanied Dwight and his wife Maria to Denver for Christmas. Now, 4 months old she is larger but is still a rambunctious puppy, full of love and mischief. She was constantly on the move, so I decided to use this older photo of her. The knitting bag I took to Denver did not have a zipper closure (I must remedy that in the future), and Emma was fascinated with its contents. If the bag was left unattended, she would grab one of the balls of yarn; therefore, I decided to name this project: Emma's Cowl. The first edition of the cowl was frogged. I could not believe that I twisted the stitches on the first round and fought with it until I saw the problem. Once I corrected the twist, the cowl progressed nicely. 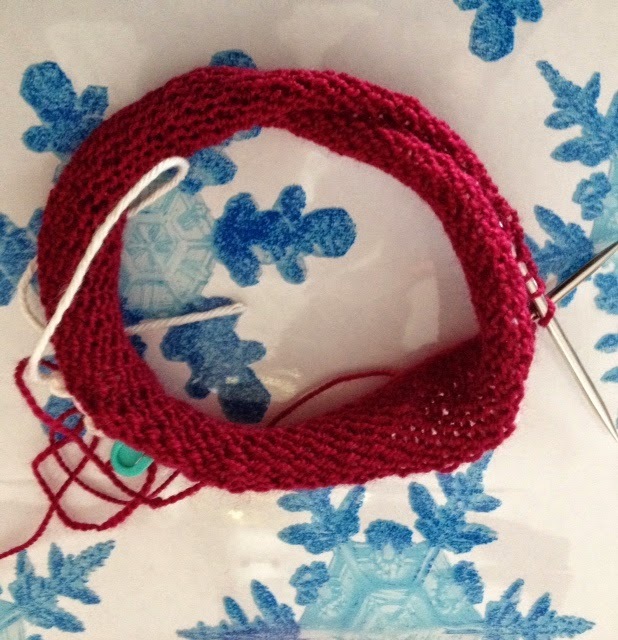 Even though I am close to the gauge given on the Very Pink Knits site, I am not happy with the length of the cowl. 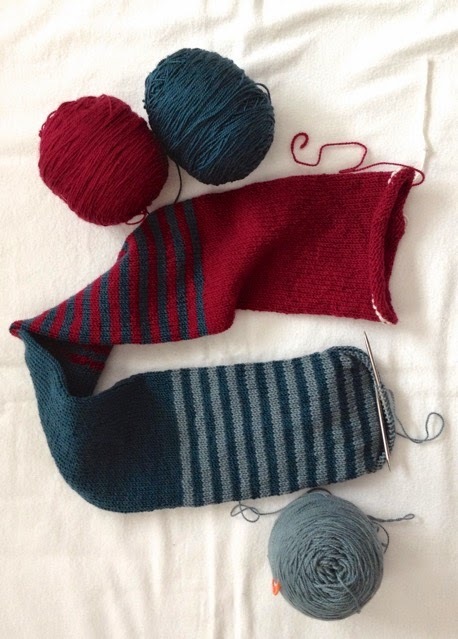 Since I think I have an adequate amount of yarn remaining, I am going to knit another round of repeats. 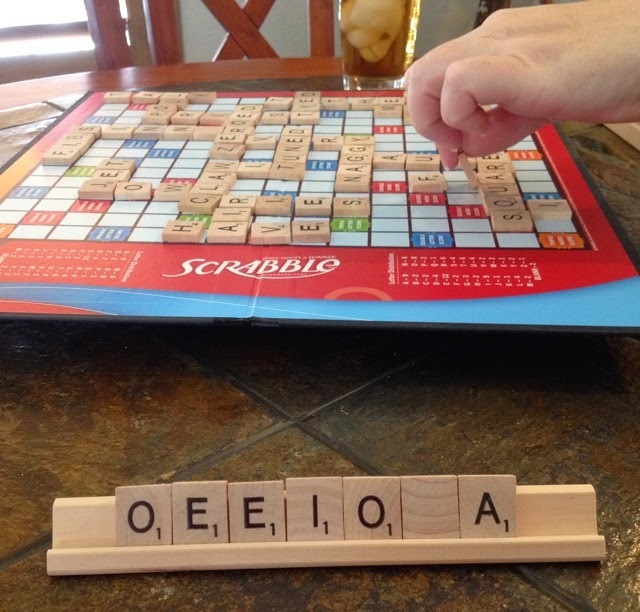 Brenda (my niece) and I played several games of Scrabble over the holiday. 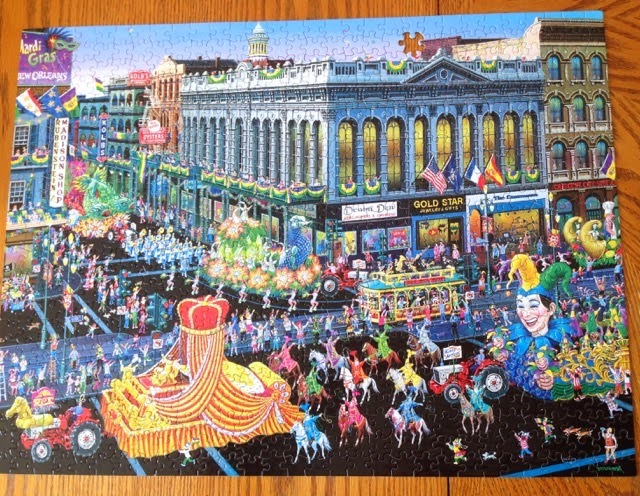 We assembled five puzzles (the smaller ones proved to be more difficult than the larger ones). Note the missing sky piece. I found it on the floor after the puzzle was taken apart. Maria some bowling tips and pointers. 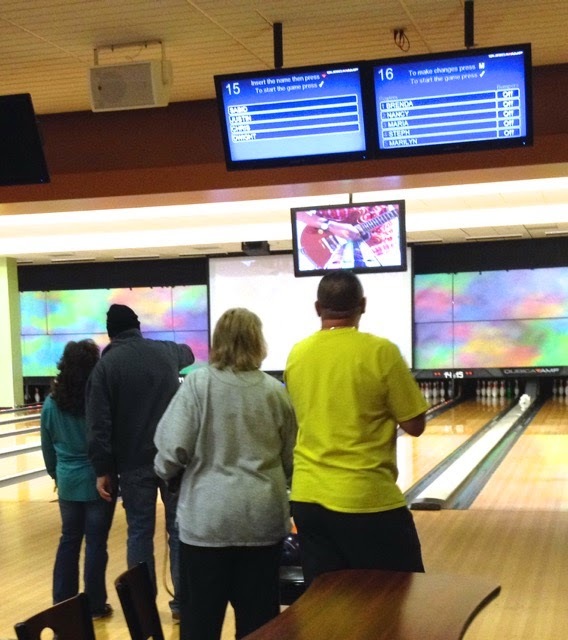 On Saturday, the whole crew (10 of us) met at the bowling alley for three games of guys versus gals. Oh my, did we have a blast! 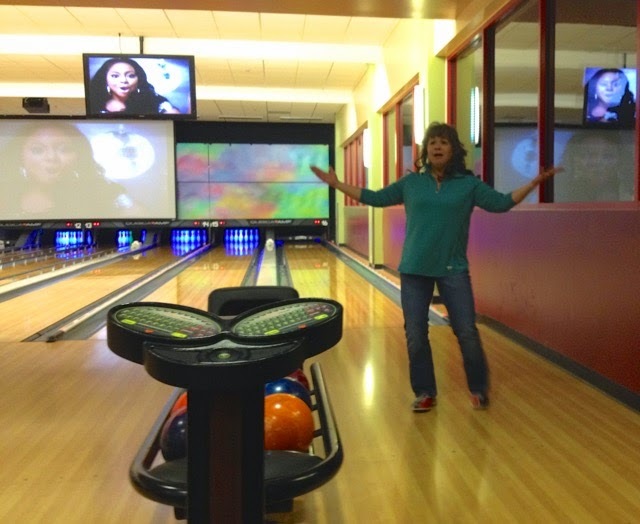 We laughed, hooted, and shimmied as pins fell or didn't fall. Honestly, I couldn't tell you which team won because we had so much fun. Back at the house, the Aggravation game saw a workout, too, which resulted in some fun, yet heated, competition. 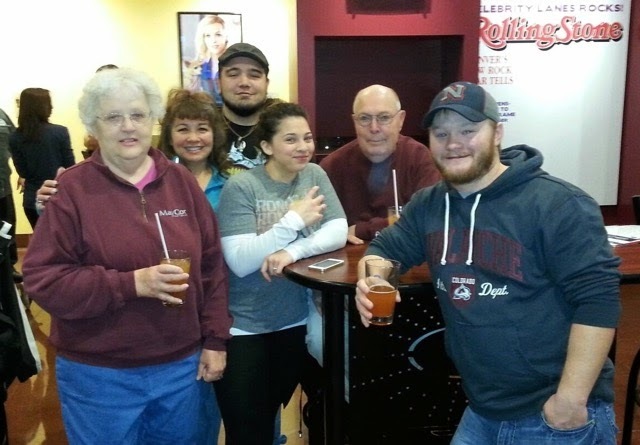 What did your family do for fun during the holidays?